More details have emerged about the man who risked his life in what appears to have been an ultimately successful attempt to stymie the murderous campaign of the racist New Zealand mosque terrorist at the second location he targeted. Determined to redirect the white supremacist, anti-immigrant extremist who went on a shooting rampage at two mosques last week, Abdul Aziz used whatever was at his disposal to thwart the terrorist’s attack, including a credit card machine and an empty shotgun he found lying on the ground. After killing at least 41 people at the Al Noor mosque, the terrorist targeted the Linwood mosque. At the second location he killed far fewer people, which appears to be in part thanks to Aziz’s efforts. Latef Alabi, the acting imam of the Linwood mosque, said Aziz “saved” many people through his actions…. In an interview, Aziz said that … his instinct was to try to keep the shooter outside to “save other people.” When the killer went to his car to apparently retrieve another gun, Aziz said he hurled the credit card machine at the murderer. The shooter quickly began firing at Aziz, who took cover behind vehicles. The 48-year-old hero then picked up a shotgun he found shell-less and discarded on the ground. 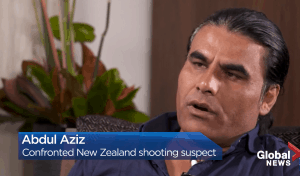 When the shooter again returned to his vehicle and got in the driver’s side, Aziz threw the gun “like an arrow” and it smashed a window, which Aziz says he believes scared the shooter, who probably thought he had fired on him…. The shooter then cursed at Aziz and drove off with Aziz chasing him down the street. Read More at Daily Wire.